This article is about the film genre. For the hypothetical Germanic goddess also known as Ostara, see Ēostre. For the holiday known as Ostern in German, see Easter. Proper Red Westerns, set in America's "Wild West" but involving radically different themes and interpretations than US westerns. Examples include Lemonade Joe (Czechoslovakia, 1964), or the East-German The Sons of Great Bear (1966) or The Oil, the Baby and the Transylvanians (Romania, 1981), or A Man from the Boulevard des Capucines (USSR, 1987). These were mostly produced in Eastern European countries like East Germany and Czechoslovakia, rather than USSR. Easterns (Osterns), set usually on the steppes or Asian parts of the USSR, especially during the Russian Revolution or the following Civil War, but presented in a style inspired by American western films. Examples of these include The Elusive Avengers (1966) and its two sequels, White Sun of the Desert (1969), Dauria (1971), At Home among Strangers (1974), The Burning Miles (1957), The Bodyguard (1979), and The Sixth (1981). While influenced by Westerns, Easterns form a specific and distinct genre. The word "Ostern" is derived from the German word Ost, meaning "East". Red Westerns of the first type are often compared to Spaghetti Westerns, in that they use local scenery to imitate the American West. In particular, Yugoslavia, Mongolia and the Southern USSR were used. Some of the East German films were called Sauerkraut Westerns. Easterns provide a counterpoint to familiar mythologies and conventions of the original genre, particularly as the makers were on the other side of a propaganda war without parallel, the Cold War, and this is partially why many have never been shown in the west, at least not until after the Cold War ended. In a war in which many fabrications were made on both sides, there was often a lingering fascination with the cultural developments in enemy countries. Westerns have proven particularly transferable in the way that they create a mythology out of relatively recent history, a malleable idea that translates well to different cultures. In Soviet Union, the Ostern uses the generic calling cards of the American Western to dramatise the Civil War in Central Asia in the 1920s and 1930s, in which the Red Army fought against Islamic Turkic 'Basmachi' rebels. By substituting, 'red' for 'blue' and 'Turk' for Mexican or Indian, there are the same opportunities for a sweeping drama played out against a backdrop of wide-open spaces. The Ural Mountains can be equivalent to Monument Valley, the Volga River for the Rio Grande. Add the gun slinging ethos, horse riding, working the land, pioneers of a sort (ideological often in this case), the bounty hunter traversing difficult terrain with outlaw in tow, railroading and taming the wild frontier and you have a generic mirror image of the American genre. One story could have many incarnations: the British Lost Patrol (1929) was set in Mesopotamia but was remade among others as the 1936 Soviet film The Thirteen, featuring Basmachi antagonists, and as the 1953 American Western Last of the Comanches. Red Westerns which use the actual American west as a setting include, the Romanian The Oil, the Baby and the Transylvanians (1981) which dramatises the struggles of Romanian and Hungarian settlers in a new land. The Czech Lemonade Joe and the Soviet A Man from the Boulevard des Capucines plump for pastiche or satire, making fun of the hard worn conventions of the American films. 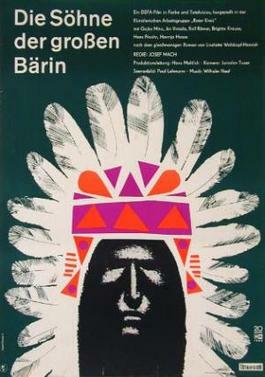 The German The Sons of the Great Bear (1966) turned the traditional American "Cowboy and Indian" conventions on their head, casting the Native Americans as the heroes and the American Army as the villains - this was well within the established tradition of Karl May's highly successful German Western novels, but had some obvious Cold War overtones. The film started a series of "Indian films" by the East German DEFA studios which were quite successful. Many of the non-Soviet examples of the genre were international co-productions akin to the Spaghetti Westerns. The Sons of the Great Bear for example was a co-production between East Germany and Czechoslovakia, starring a Yugoslav, scripted in German, and shot in a number of different Eastern Bloc countries and used a variety of locations including Yugoslavia, Bulgaria, Mongolia and Czechoslovakia. The Oil, the Baby and the Transylvanians was a Romanian film, but featured emigrant Hungarians heavily in the storyline. There is some divergence between the true Red Western and the true Eastern in their portrayal of certain subject matter. Proper Red Westerns share some features in common with the general Revisionist Western, notably, a more sympathetic portrayal of working people, Native Americans, and Mexicans. In the true Red Western more focus was put on the lawlessness of the time period, favoring realism over romanticism. With the true "Ostern" ("Eastern"), some of these tendencies may be reversed, particularly in reference to Soviet history and particularly in the context of the Russian Civil War and Basmachi rebellion. Sympathy for the working class is obviously paramount, but it is also common to romanticise and stereotype non-Russian characters. Thus, Osterns often cast Russian or Jewish actors in prominent "ethnic" parts. Spartak Mishulin, who plays Sayid in White Sun of the Desert, and Konstantin Raikin, who plays Kayum in At Home among Strangers, are just some examples of this (compare Eli Wallach in The Good, The Bad, and the Ugly). At Home among Strangers, for example, whilst critically acclaimed, has a very one-sided view of its period, which was partly due to political pressure. What they both share with the revisionist Western, includes a disdain for the business class (cf Once Upon a Time in the West and its critique of the rail builders), organised religion and Christianity and the idea of the "American Dream" and its related ethic. There is also some common ground with the Zapata Western genre, which is often related to the Mexican Revolution, notably A Fistful of Dynamite which is a serious, non-romanticized look at revolution. In Dauria (1971), Siberian Cossacks are acting like American cowboys: horseriding, fighting, shooting, and even robbing a bank. A number of films from the former Eastern bloc, while not falling neatly into the genre, are partly influenced by it. Siberiade by Andrei Konchalovsky, the isolated Siberian frontier town, which becomes irrevocably changed thanks to the discovery of oil, bears a resemblance to Western family epics. "Gibanica western" was a short-lived term for the Yugoslav equivalent of the Ostern, more commonly known as partisan film and, sometimes, the Partisan western. They were made in the 1960s, 1970s and 1980s, and were about the partisans in World War II. The Goulash westerns are the Easterns of Hungarian director György Szomjas. He directed two films (The Wind Blows Under Your Feet and Wrong-Doers) in the 1970s. Native American hobbyism in Germany, a hobby consisting of Germans impersonating American Indian culture. Vsevolod Ivanov, Soviet writer who was a formative influence on the Ostern.